In a world that’s increasingly trying to combine all of its gadgets into a single device, hybrid devices seem to be the flavor of the month. Yesterday, we reported that Samsung’s highly anticipated follow-up to the Galaxy Note, the (surprise, surprise!) Galaxy Note 2, could see the light of day this August and will bring with it a host of upgrades such as a faster processor, a bigger screen and an improved display. Fans of phablets, however, may be interested to know that a similar device is already out there — the Asus Padfone… Well, at least the device’s phone-part is. It’s hard to classify the Asus Padfone and is perhaps the first true phablet device. It potentially comes with four parts: The Padfone itself which is a 4.3 inch Android phone running Ice Cream Sandwich and has a built in 32 GB of storage, the Padfone Station, which is a tablet device where the Padfone slides in, a unique stylus and an optional keyboard dock that will allow you to add another slash to your phone/tablet by turning it into a notebook laptop that also increases your device’s battery life. Let’s talk about the additional features in more detail. The Padfone has pretty decent specs — it has a Super AMOLED screen that has a resolution of 540×960 and a pixel density of 256 ppi. Under it’s hood is a 1.5 GHz Snapdragon S4. It has n 8 MP camera that can shoot 1080p HD videos and comes with an Adreno 225 graphics chip. Not content with just 32 GB of storage? You can add to that because the Padfone can also take up to 32 GB of memory from a microSD card. And if you want more functionality, just slide it into its Padfone Station dock to turn it into a 10.1 inch WXGA TFT Touchscreen tablet that has a resolution of 1280×800. How cool is that? So how much does this thing cost? That’s the best part. Right now, the device is priced at around $1000 and considering all that you’re getting, it’s definitely not a shabby deal. 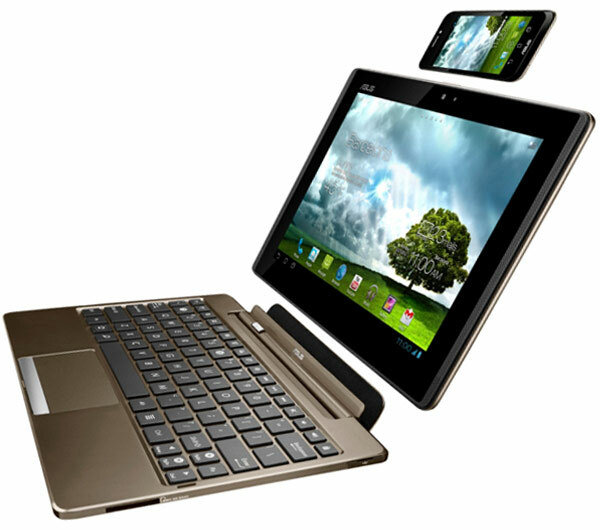 So what are your thoughts on the Asus Padfone? Something worth checking out? Or a gimmicky device that’s bound to be forgotten?